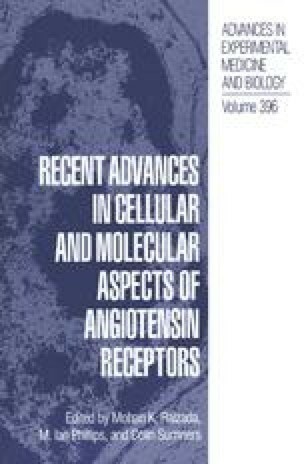 It is well established that the brain contains an endogenous renin-angiotensin system (RAS) that participates in the regulation of blood pressure through the control of water intake and sodium appetite, the secretion of ACTH and Vasopressin and the regulation of sympathetic tone (1). While high affinity binding sites for Ang II were initially characterized in brain homogenates (2, 3), the technique of in vitro receptor autoradiography allowed visualization of Ang II binding sites to specific brain regions including the circumventricular organs, hypothalamus, dorsal and ventral medulla, spinal cord and pituitary gland (1, 4, 5). These brain regions correspond to areas at which the peptide exerts its physiological effects (5) or where the responses are inhibited by Ang II receptor antagonists (6).